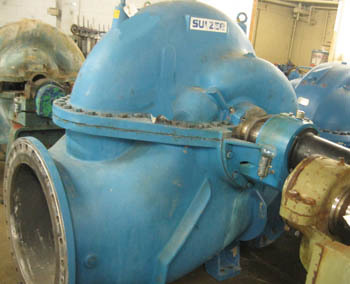 Description: Sulzer ZPP Size 51-600 Split Case Pump, Constructed of 316SS Casing and Rotating Assembly. Size 24" x 28"; Materials 316 SS Casing and Rotating Element. Flow Characteristics: 19,050 GPM; 64 FtHd; 700 RPM. Year 2000.